The chance of a string of record hot years like 2014-2016 happening without human-caused climate change is very tiny, a new study shows. Global scientists relied on the typical superlatives to describe the state of the climate in 2016, but they might have come up with a few neologisms as well. It was not only the hottest year on record, but one of the droughtiest, high-tidiest and altogether worryingest. Driven by the inexorable warming brought on by record concentrations of carbon dioxide and other greenhouse gases in the atmosphere, and vaulted even higher into the record books by the effects of a powerful El Niño, the signals of climate change were unmistakeable and remarkably diverse, the authoritative annual review, State of the Climate in 2016, shows. • Concentrations of carbon dioxide in the atmosphere, the main blanket of gases warming the planet, increased by the largest year-to-year jump in the six decades of measurement and surpassed 400 parts per million for the first time as an annual average. • Sea level rise has been accelerating over time and hit another record in 2016, according to the report. The global oceans have been going up an average of .13 inches a year for two decades and were, on average, 3.25 inches higher last year than in 1993. Sea surface temperatures also hit a record high in 2016. 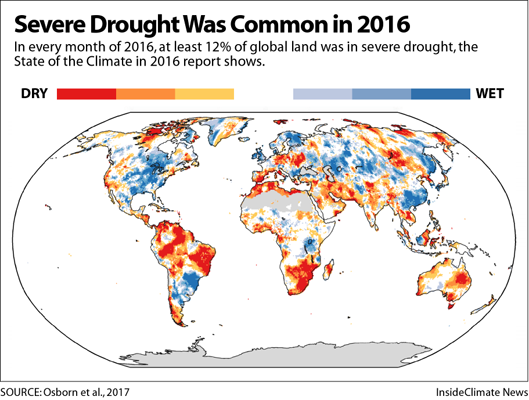 • In every month of the year, well over a tenth of the planet experienced levels of drought that were “extreme” or worse—another record. • Regional effects were even more pronounced in some places—notably the Arctic, where temperature records were decisively smashed and the sea ice again hit a record minimum. These and other findings for 2016 were published by the U.S. National Oceanographic and Atmospheric Administration (NOAA), in concert with other authoritative sources, as they are each year. The report’s language was typically dry: “the major indicators of climate change continued to reflect trends consistent with a warming planet.” But the message was not just a repetition of the usual scientific mantras. The alarming data in this annual report becomes more pronounced each year—and more thorough, now wrapping in the efforts of hundreds of scientists and authoritative institutions around the world. The number-crunchers are also more certain than ever that the records broken over the past three years were not a fluke, but were driven by human activity. Another study announced Thursday and scheduled for publication in the journal Geophysical Research Letters finds that consecutive years of record-breaking heat—in 2014, 2015 and 2016—would have been “extremely unlikely” without human-caused climate change. “With climate change, this is the kind of thing we would expect to see. And without climate change, we really would not expect to see it,” said Michael Mann, a climate scientist at Pennsylvania State University and lead author of the study, in a statement. Mann’s study looked at historical temperature data and climate model simulations, finding that the likelihood of three consecutive years of record-breaking temperature happening after 2000—without the effects of human-caused climate change—is .07 percent. The likelihood of that happening with the effects of human-caused climate change factored in rises to 50 percent. The release of Thursday’s NOAA report follows the leaked draft of another government report that was published by The New York Times. That “final clearance draft” of the Climate Science Special Report—an earlier version of which was published in December—makes clear that fossil fuel emissions are the principal driver of climate change. The document is the cornerstone of the National Climate Assessment, required by law to be published every four years. The next full assessment is due in May 2018, but a first draft is expected this fall. Meanwhile, the latest government bulletins show parts of the country are battling exceptional drought as hot temperatures in the West last month have made 2017, so far, the second hottest year on record in the continental U.S. Since early June, an ever-broadening patch of eastern Montana has been in “extreme drought,” and in early July, part of that area entered “exceptional drought,” the National Centers for Environmental Information reported. As of Thursday’s latest figures from the U.S. Drought Monitor, nearly a quarter of the state is under extreme drought and nearly 90 percent is experiencing some level of drought. Some wheat growers have already lost entire crops to the drought. Cattle producers, meanwhile, are taking emergency hay donations for their livestock and are being allowed to graze their animals on normally off-limits conservation land. The damage won’t be fully calculated until after the summer harvest, but Steve Becker, the outreach coordinator for the Montana Wheat and Barley Committee said some wheat growers are seeing total losses. “In some areas they have cut their winter wheat and sold it as hay because it’s not worth bothering to take to an elevator,” Becker said. The hard part is in teaching people the difference between local weather and global climate. For example, here people are wearing light jackets in August, normally our hottest month, so they say global warming is nonsense. People do insist that, thanks to modern technology, their motor vehicles don’t contribute to climate change. But mostly, it’s hard to be concerned about the long run when people are fearful of losing their jobs, in between worries about nuclear war.